You want to learn how to knit or at least brush up on your skills or try out a new method of knitting? You have come to the right place! 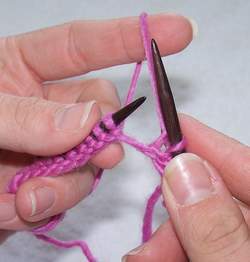 Here, you will find FREE and EASY instructions with pictures on how to execute the basic knit stitch. 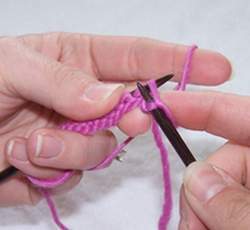 In knitting, there are only two stitches to learn - the knit stitch (k) and the purl stitch (p). These two stitches are the foundation of all knitted fabrics. Once you have mastered these two EASY stitches the possibilities in your knitting are endless! By combining them in different ways you will soon be able to knit ribbing, textures, cables, and much, much more! Not to mention create a variety of original design bags and purses! 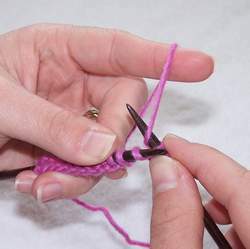 With the yarn held to the back of the work, hold needle with cast on stitches in your left hand, and insert the right hand needle into the front of the first stitch from left to right. Pull the new loop (the yarn you just "threw") through the stitch on the left hand needle. Now, slip the stitch off the left hand needle. You should be left with your remaining unworked or live stitches on the left hand needle and one stitch on the righthand needle. You have completed a knit stitch! 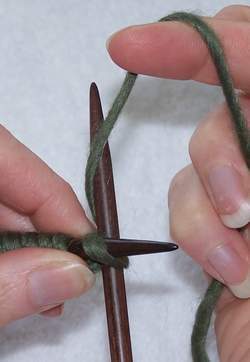 Repeat these steps for each stitch on the left hand needle. When all the stitches are transferred to the right hand needle (where the new row is formed) you are at the end of the row. Swap the needle with the stitches into your left hand and the now empty needle into your right hand. 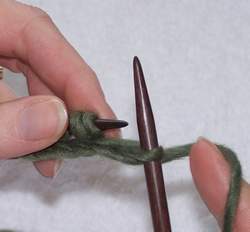 Now, start to work the stitches on the left hand needle the same way as you did to start. Now you know how to knit! 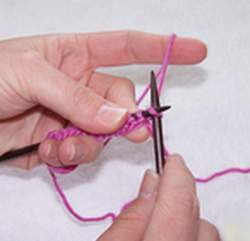 Hold the yarn in your left hand and hold needle with cast on stitches in your left hand. 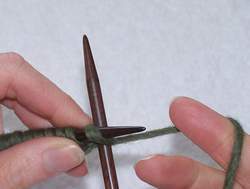 Insert the right hand needle into the front of the first stitch from left to right. "pick" the yarn counter clockwise around the right needle. Pull the new loop (the yarn you just "picked") through the stitch on the left hand needle. Use the right forefinger to hold new loop if needed. Now, slip the stitch off the left hand needle. You should be left with your remaining unworked or live stitches on the left hand needle and one stitch on the right hand needle. Repeat these steps for each stitch on the left hand needle. When all the stitches are transferred to the right hand needle (where the new row is formed) you are at the end of the row. Swap the needle with the stitches into your left hand and the now empty needle into your right hand. 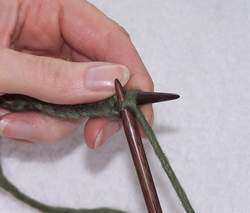 Now, start to work the stitches on the left hand needle the same way as you did to start. Now you know how to knit! Little Tip: When you knit every row you end up with a garter stitch. A garter stitch has rows of raised ridges on the front and back of the fabric therefore, it looks the same on the front and back so it is reversible. Now that you know how to knit you can learn How To Purl or let's see how to finish our work and learn how to bind off.